For the past six or seven month I’ve really been suffering with my skin. For the first time in a long while, I’ve had pretty much constant breakouts on my forehead, and some also on my cheeks and jawline most weeks. We’re not just talking little ‘oh a little bit of concealer will hide it’ kinda spots either. No, these are the ones that will do anything to be seen! Basically it seems as though my skin decided it was time for a change, and kicked up a fuss at anything I tried to use to combat it. My skincare favourites (Liz Earle, Neal’s Yard, Dermalogica) weren’t cutting it anymore, so I’ve been on the hunt for a while to find products that would help calm the breakouts and get things back to normal. Lo and behold, I think I’ve finally cracked it! I’ve been sticking to this combo for the past month or so, and can’t quite believe the difference in my skin. We’re not 100% there yet, but there’s been a huge change and I’m finally starting to feel confident enough to show my face again! As soon as I wake up I head straight for the bathroom where I rinse my face with warm water then massage some of the Good Things Stay Clear Purifying Cleanser, taking extra care to work it in to particularly bad areas. 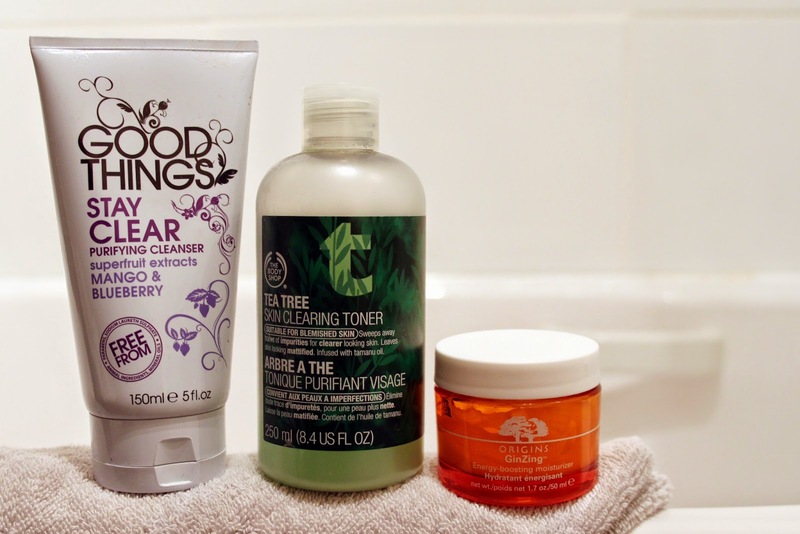 I spotted the Good Things range in Boots recently, and after a quick Google whilst I was in store to find out what the reviews said, I knew I had to give them a whirl! This smells delicious and is packed with good ingredients too. After about a minute, I gently take this off with a warm damp muslin cloth and rinse. Next I move on to toner. This is a step I always missed out, but after being recommended this one for my blemish prone skin by a friend at Body Shop, I decided to try it out and have been hooked ever since! I sweep the Tea Tree Skin Clearing Toner over my face using cotton wool pads, and it leaves my skin feeling super fresh, clean and awake. To finish off I massage a little of my all time favourite moisturiser, Origins GinZing, over my face to leave it soft, refreshed and ready for some make up! At night I like to remove my make up using The Body Shop Camomile Silky Cleansing Oil. This works like a dream and completely melts off my make up in a matter of seconds (even a heavy liner or smokey eye!!). I massage it in to my skin to ‘lift’ the make up, splash on a little warm water then take everything away with a warm damp muslin cloth. I then rinse my skin, before getting to my favourite part – the scrub! This is another item from the Good Things range, which is the Blackhead Exfoliator. This smells just as divine as the cleanser yet I feel this one does a lot more. The scrub is quite fine in texture so it’s exfoliating without being too harsh on the skin, it really helps get rid of any make up I’ve missed, and it gives my skin a deep clean. I rinse it off with warm water afterwards, then go in with the same Body Shop toner on a cotton pad as the morning. I’ve never been one for a moisturiser in the evening as I tend to suffer from very oily skin in the mornings. I heard Caroline Hirons talk about the Vichy Normaderm Night Detox which claims to control the production of sebum whilst you sleep. I just had to give this a whirl after hearing such rave reviews and I haven’t looked back since! I’ve not woken up to oily skin in over a month and I thin this may have a lot to answer for when it comes to keeping my skin clear! Absolute dream product! So those are the products I am really enjoying using on my face at the moment, and they really do seem to be doing the trick. 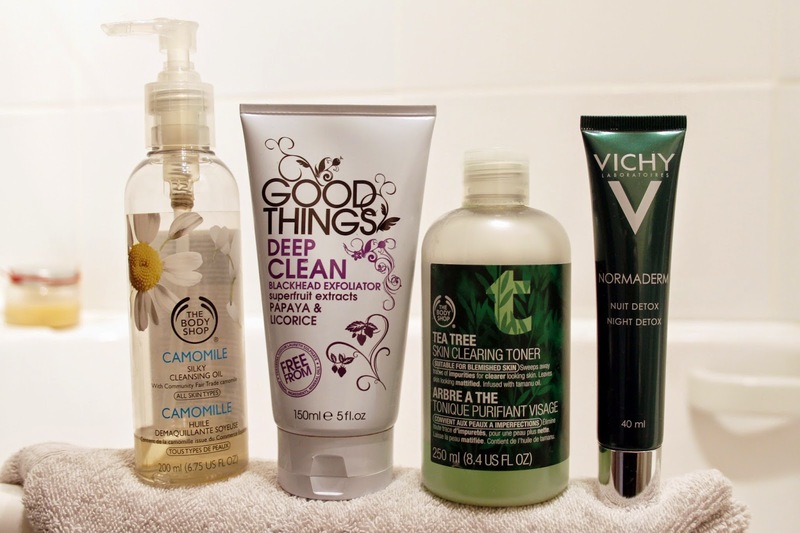 If you suffer from oily, spot prone skin then I would definitely recommend them all, particularly the Good Things range and the Vichy Night Detox, as I think they’ve made a world of difference for me. Obviously everyone’s skin is different though, so what works for me may not always work for you! Are there any products you’d recommend for my skin type? What does your skincare routine consist of? "STEPS TO A HEALTHIER DIET"